Innovative way to lock and unlock your Mac. Is there a better alternative to Screen Vault? Is Screen Vault really the best app in Security category? Will Screen Vault work good on macOS 10.13.4? Screen Vault brings you a brand new innovative way to lock and unlock your Mac. Remember the old combination dial lock on your locker from high school? Well, Screen Vault brings that same experience to your Mac. Using the rotate gesture of the track pad, you can use the combination dial to unlock your Mac with your personal 3 digit combination. Don't have a track pad or don't want to use a combination lock? Screen Vault comes with another way to unlock your Mac. You can choose between using the combination dial and using a pass pattern to unlock your Mac. Made the combination dial less strict. You can now pass your number by 1 in each direction and it will still register as the correct number. Added option to have an e-mail sent with a snapshot if an intrusion is detected. Screen Vault needs a review. Be the first to review this app and get the discussion started! Screen Vault needs a rating. Be the first to rate this app and get the discussion started! Themes: Change the look of Screen Vault by changing the graphics and text using the built in Theme Designer. Unlock Options: Unlock your mac using a combination lock by utilizing the rotate gesture of your track pad or use a pass pattern seen on most Android phones. Sounds: Change the way you lock and unlock your mac by choosing your own lock and unlock sounds. Intruder Snap Shots: Screen Vault can be setup to automatically take snap shots of intruders when they try to unlock your mac with an incorrect combination or pass pattern. Intruder Video Recording: Screen Vault can be setup to automatically start recording the second someone tries to unlock your mac with an incorrect combination or pass pattern. Video Surveillance: Screen Vault can be setup to automatically start recording video as soon as you lock your mac. A useful feature if you want to know what's going on while you're away. iTunes Info & Controls: Control what song is playing in iTunes while your screen is locked or view information about the current song that's playing. iTunes controls and info are widgets that can be turned on or off in preferences. Snapshot & Video Log: A built in log that allows you to easily view snapshots and video footage of intrusions. Updated tutorial window to show correctly on lower resolution screens. 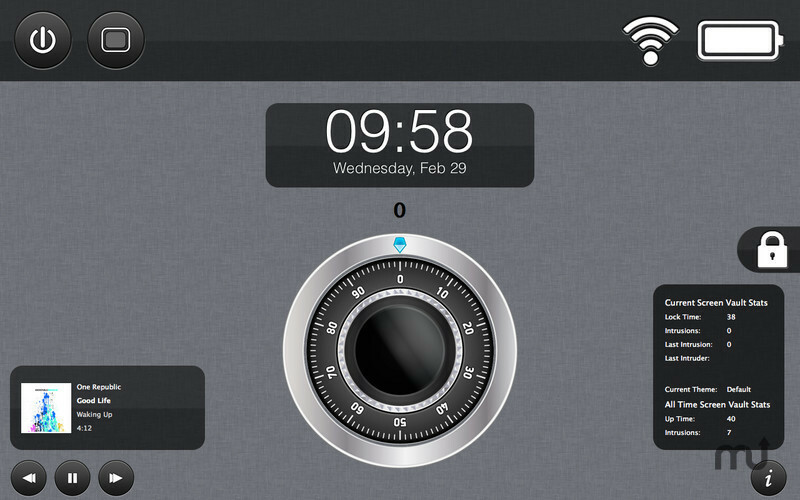 Added option to have Screen Vault lock when awaking from sleep.